Head of a Female Votive Figure, early 5th century B.C. This monumental head, originally painted, belonged to an over-life-size statue of a votive figure or deity from Cyprus. While its exact function is unknown, the statue probably stood in a sanctuary. The amalgam of styles evident here reflects the tumultuous history of Cyprus during the first millennium B.C. : this eastern Mediterranean island was ruled by Assyria and Egypt in quick succession, and in the mid-sixth century, it developed strong ties with eastern Greece while both were part of the Persian Empire. 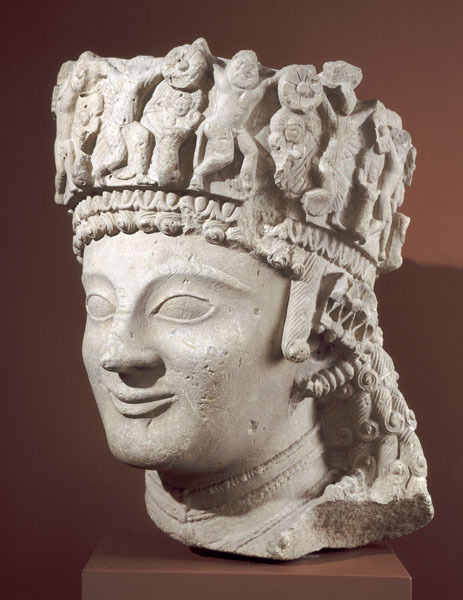 The sensitively modeled oval face with almond eyes, high cheekbones, and smile indicate an affinity with art from eastern Greece in the Archaic period. On the headdress a throng of maenads and silens, companions of the Greek wine god Dionysos, dance through a colonnade topped with rosettes. Whereas column capitals in the form of heads of the goddess Hathor reveal artistic kinships with Egypt, the feathered brows and the treatment of elaborately curled and patterned tresses suggest Assyrian influence.